Running, Outdoors, Gluten Free, and Healthy Living Tips. *Lindsay’s Note: The following is a guest post by Karen Wojciechowski. Karen loves making homemade health bars and came up with an amazing paleo protein bar recipe for Fit & Awesome. This recipe looks AWESOME. Enjoy! I love dark chocolate and love to include it in my recipes and find healthy ways to add it into my diet whenever possible. However sometimes I don’t have really good quality dark chocolate in the house (it goes really fast) and it totally melts everywhere when I take my homemade protein bars out mountain biking or hiking. So I was super excited to discover raw cacao nibs and use them in this paleo protein bar recipe. Help keep your heart healthy. So here is my favorite paleo protein bar recipe to use raw cacao nibs in. 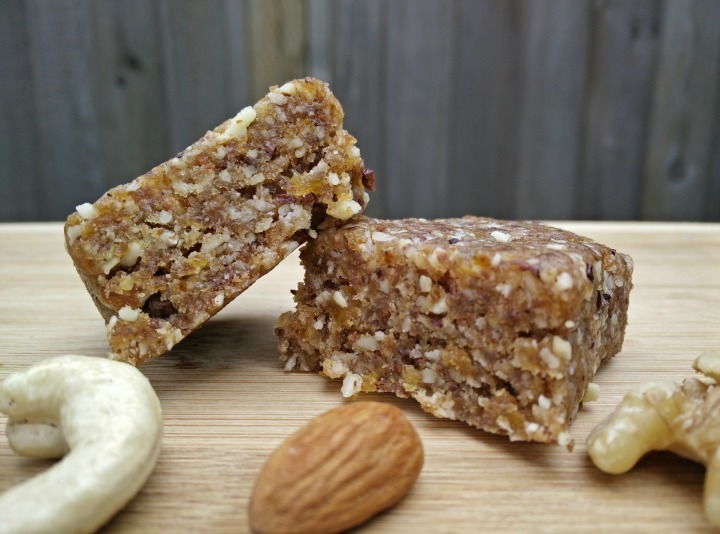 These homemade bars are awesome to have as a snack or take out with you hiking or biking. Hope you enjoy! This homemade paleo protein bar recipe makes 6 servings. Add all the ingredients together into a food processor and mix well. Once all the ingredients are completely combined take the mixture and divide into 6 portions. Mold each portion into a bar shape and put into the fridge to set. Take out of the fridge after about half an hour and enjoy. What about you? Have you ever made homemade protein bars? 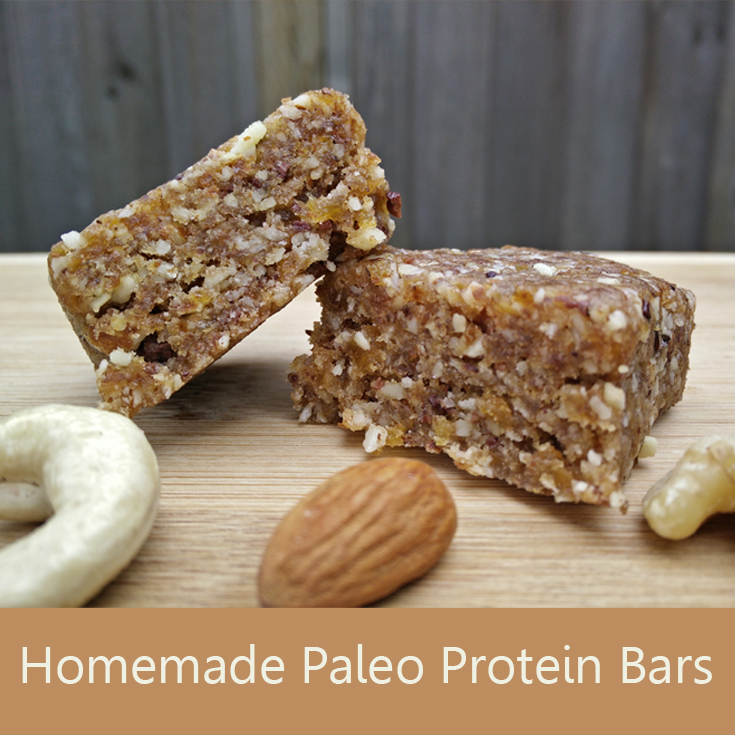 Would you try a paleo protein bar recipe like the one above? Post in the comments and let us know! 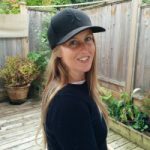 A keen runner, mountain biker, snowboarder and outdoor enthusiast, Karen started RealEnergyFood.com to share what she has learned about creating healthy energy food on the go. Passionate about health and fitness, if she is not outdoors she is happiest in her kitchen making delicious, healthy homemade sports supplements. She has a bachelor’s degree in science and is currently training at the Institute of Integrative Nutrition. She loves researching the best ingredients for awesome recipes to get you performing at your optimal level. Mmm..dates. I know all about the new mom eating plan. Oy! Let us know how the recipe goes once you make it! THOSE LOOK AMAZING!! I wish I had one right now! Well done! Also, just realized I totally dropped the ball and owe you an email. I am so sorry! I’ll get on that asap! Please forgive me… :/ Life got too busy for my own good! Thanks, Lora! I am looking forward to trying out Karen’s recipe myself. No worries on the email at all. I know we are all busy and I look forward to hearing from you! Signup to receive email newsletter updates from Fit & Awesome! Visit Lindsay at Fit & Awesome's profile on Pinterest.